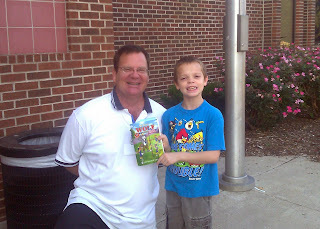 My son, Rob, loves Cub Scouts. One of his Wolf achievements is to learn about the U.S. and State flag and proper flag etiquette. 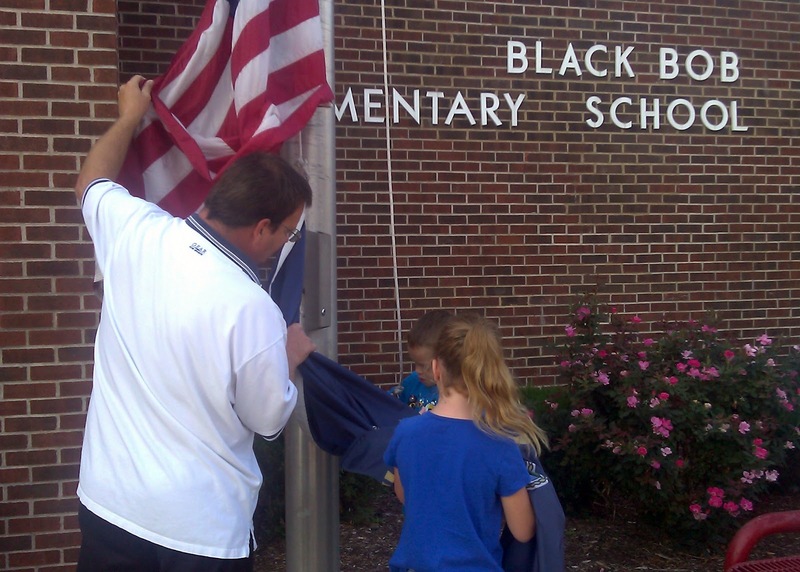 At home, we talked about the Pledge of Allegiance, what it means, and why it's important. 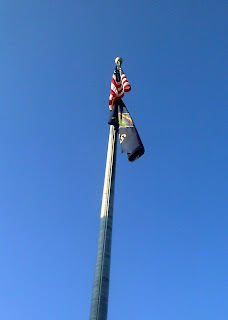 When we got to the State Flag section, I thought I'd need to do some research, but Rob already knew a lot about it. He became my teacher as he told me what the symbols meant and how it's displayed. 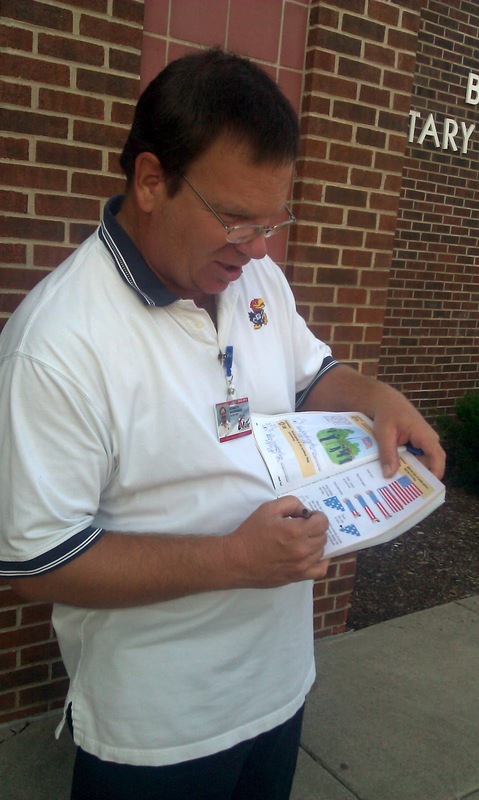 Of course, he knew it all because his awesome music teacher at school, Mr. Woodward, goes all out for Kansas Day and really gets the kids excited to learn about their state's heritage. 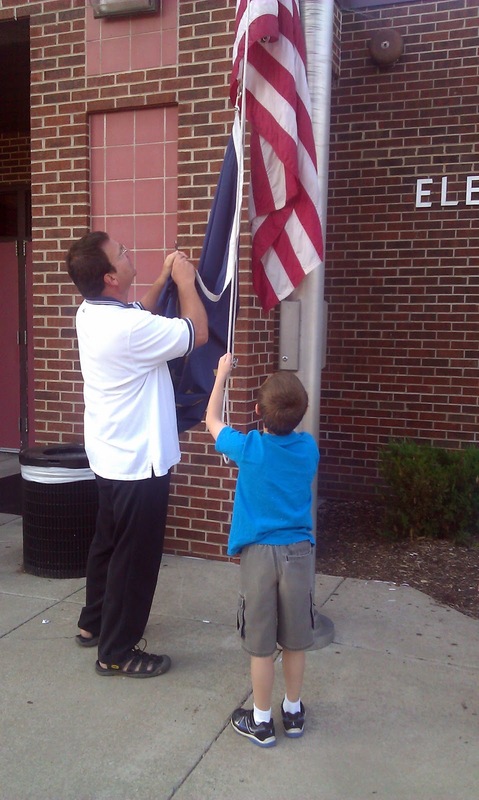 Rob has learned so much from his music teacher, he asked me if Mr. Woodward could teach him to fold and raise the flag, too. 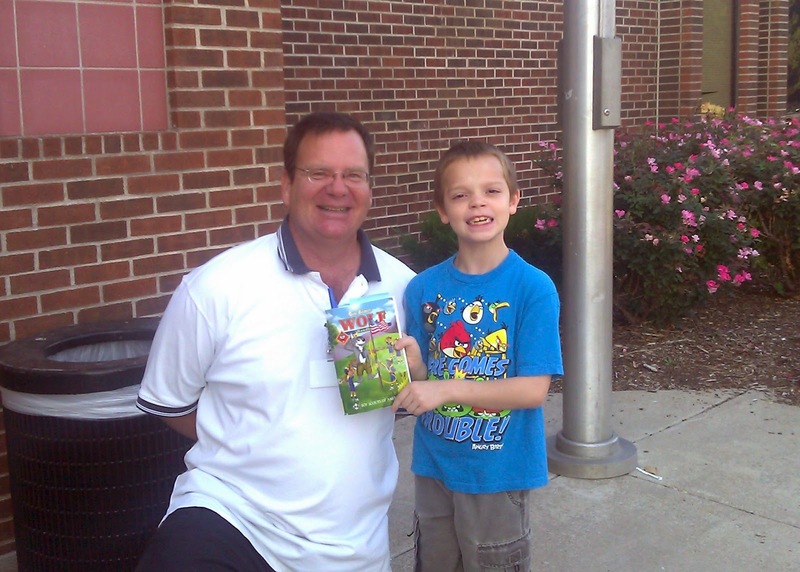 Mr. Woodward is the awesome kind of teacher who was willing to come to school early today to help my son. 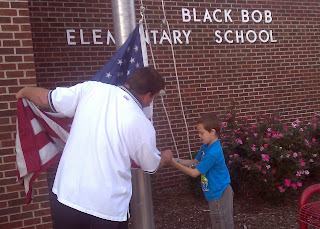 Rob was super excited to work with one of his favorite teachers and get to raise the flag for school. Mr. Woodward taught Rob that the flag is lowered slowly while everyone else either salutes or puts their hands over their heart. 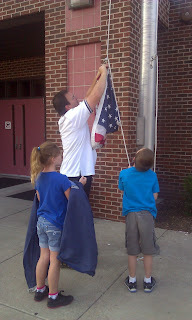 Rob did a great job slowly lowering the flag. 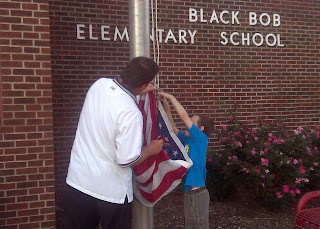 Then Mr. Woodward assisted him by unhooking first the state flag and handing it off to another student who helped. He then unhooked the U.S. Flag while Rob continued to hold the ropes, attentively listening as Mr. Woodward talked about respecting the flag, handling it carefully and not letting it touch the ground. 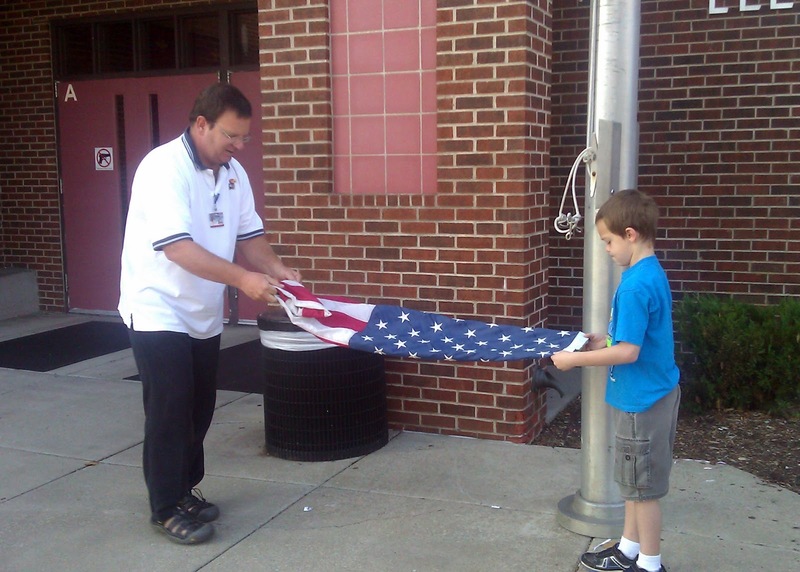 Next, Mr. Woodward taught Rob how to fold the flag. Together they folded the flag together twice. 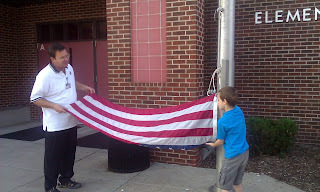 Then Mr. Woodward started from the red striped side and began the triangle fold. 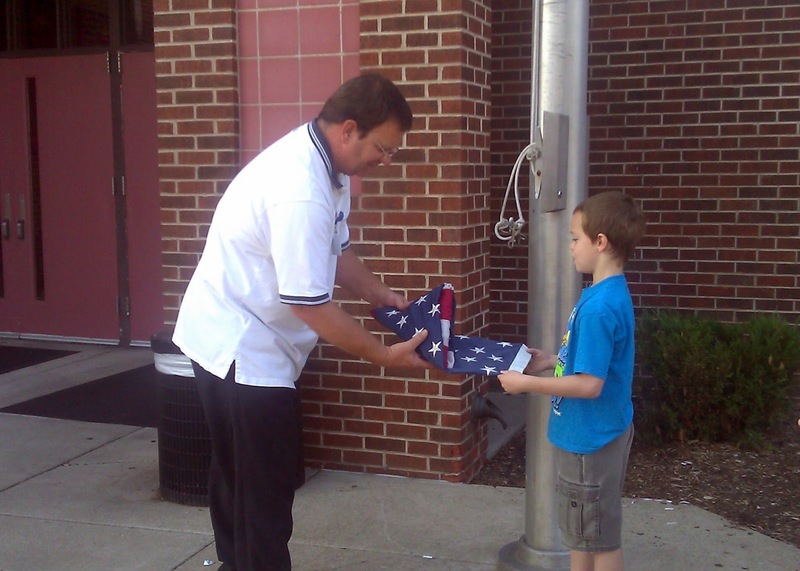 He talked with Rob about why the flag is folded in a triangle (how it looks like the hats worn during the American Revolution and shows no red). He taught Rob how to fold and tuck the end - Rob was excited to do that part! Finally, Mr. Woodward taught Rob about unfolding the flag, how to hook it so it's right side up (because upside down is an international signal of distress! 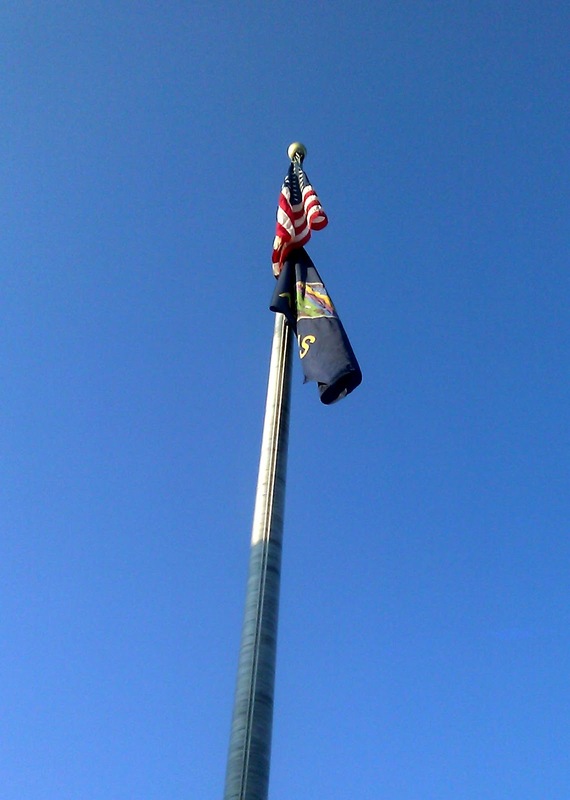 ), and that when you raise the flag, you raise it briskly (the opposite of when it's lowered). Then they did exactly that together. 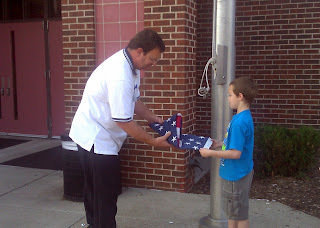 With a hand over my heart, I watched while my son briskly raised the U.S Flag & Kansas State Flag for his school. 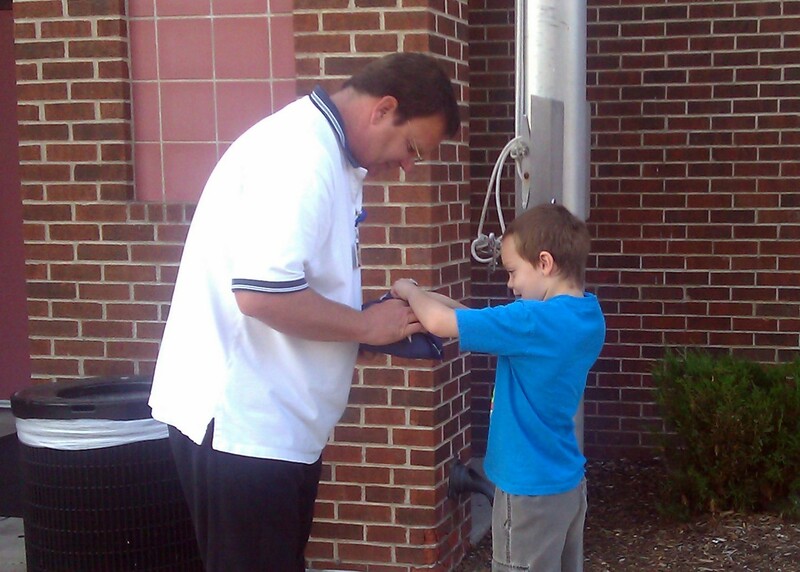 What a touching moment! Mr. Woodward finished up with congratulations to Rob, signed off on some of Rob's Wolf flag requirements and I got a picture of the two together. Today, I'm grateful for an incredible teacher who truly loves his students, an awesome son, and the opportunity to teach my children about the great country we live in. 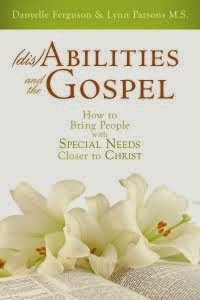 What are you thankful for?